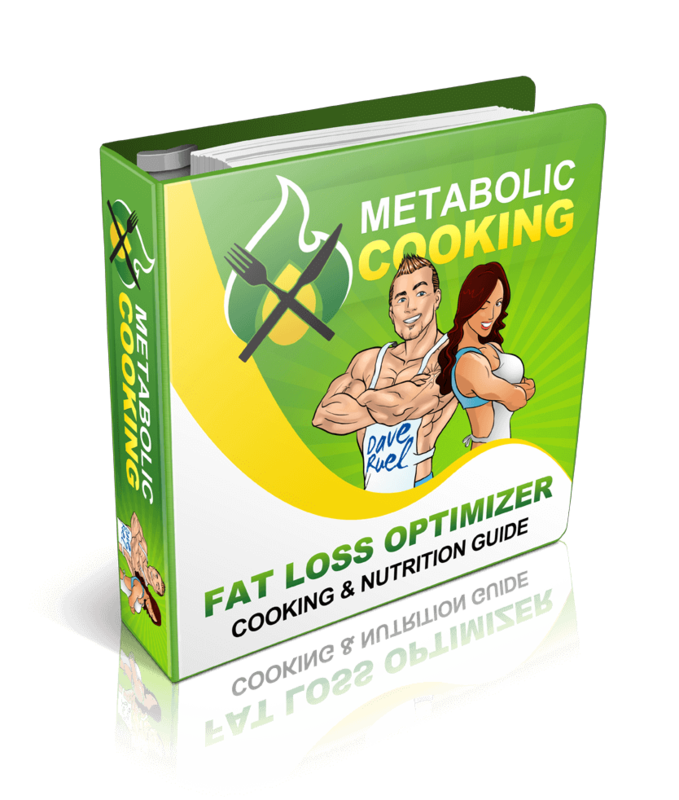 Metabolic Cooking Fat Loss Cookbook Review! Before we get into my Metabolic Cooking Fat Loss Cookbook Review. I would like to take a minute and go over what your metabolism is. By now we have all heard the term metabolism right? We all know that it has something to do with our body, yet we may not be clear as to how it effects us. To keep it simple, metabolism is basically the physical and chemical process the body uses to turn food and nutrients into energy. It is this formation of energy that is one of the most note worthy components of metabolism. Consequently, what we eat and the food we put into our body is very crucial to the performance of our metabolism. The better our metabolism the fitter we will be in our lives. The nutrition we feed ourselves has a direct effect on the ability of the cells within our body to function properly and remain healthy. It is due to this connection that you can indeed lose weight by cooking and eating with your metabolism in mind. That has brought us to this review in which we will take a closer look at the Metabolic Cooking Cookbook. As well as how it may be able to help us achieve our weight loss goals. 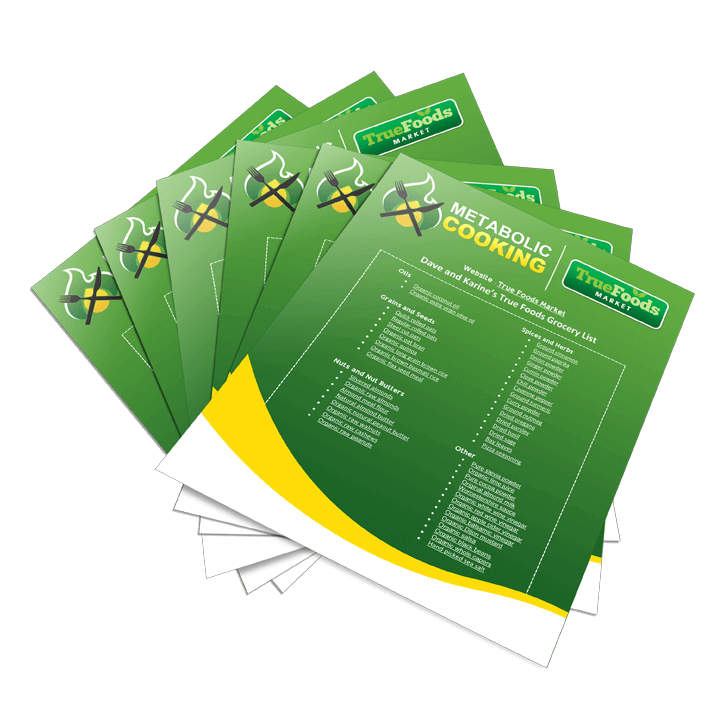 The Metabolic Cooking Cookbook was created to teach you how to prepare delicious food in a healthy manner to support weight loss within the body. Most of all you will learn what foods and herbs promote the metabolic burn, and light your fat burning torch! While the recipes are created using many low calorie foods, it is not meant to be a “calorie crusher” of a diet. Therefore is is instead designed to use fat burning foods and recipes to help you create a new life style. Okay know let us take a look at the benefits and features that the Metabolic Cooking program has to offer. We will also cover some of the down falls within the program, because we all know nothing is perfect. Step 1. Metabolic Nutri-Profile – This tool helps you figure out what foods to combine with each other. As well as the best time of the day to eat those foods to optimize fat loss. Rather than leaving you with a bunch of guess work, this guide helps you to know exactly what to eat and when! Step 2. Metabolic Food Cycling – This is used to help fight Metabolic Adaptation, which is your bodies natural tendency to get accustom to what you are eating. This is done by varying the nutrient sources and add new and different foods along the way, to aid in resisting a metabolism slow down. Step 3. Thermocharged Fat Burning Ingredients – This will basically be your shopping list. It is an entire list of foods and herbs that have been approved by the Metabolic Cooking staff. These foods were chosen on their ability to help us burn body fat. Some of these foods will even help to burn fat just by being digested! You are downloading a lot of information and if you have a poor internet connection this will make that process a long one. So make sure that your internet is up to speed. There is little scientific backing here and nobody has all of the answers to what is an optimal food and nutritional intake. As with anything regarding your health you should always consult your physician before starting any new diet or programs. You will receive over 250 recipes all meant to help you create tasty fat torching meals right in your own kitchen. These recipes are broken down into a 9 part cookbook with, each section focusing on one particular food group. Here is a look at all of the great free bonuses that are included with the package. This guide is loaded with all of the information you are going to need to know to master the art of Fat Loss Cooking! You will learn the top foods you must eat to burn fat as well as the 10 Rules of Metabolic Cooking for success! This will teach you how to get the most out of the Metabolic Nutri-Profile, how to layout your own individual plan of attack, and even provide you with shopping and saving tips! This bonus will help to teach you how to make some incredible fat burning salads. They will not only melt in your mouth they will melt away that body fat as well! These salads are meant to stimulate your metabolic burn and light you fat burning torch! You will find out how to make your own salad dressings to enhance the taste and metabolic powers of the salads. These dressings have no calories, no chemicals, and they are not loaded down with sugars! Good luck getting that from the healthy dressings found in the grocery store! So you know those days when you are running way late and you do not have the time to cook up a great meal and you just need a quick solution. No Problem! This is where the Thermo-Charged Seasonings will save the day! they can be used to give that real meal taste to any ole boring piece of chicken or other protein you may be using. What they have done is come up with some fantastic Sodium Free Thermo-Charged Seasonings that can be added to anything in just seconds. These seasoning all possess a similar metabolic enhancing power as do the full recipes. Although cooking a full metabolic meal is ideal, these seasoning allow you to receive some great metabolic results in a pinch! 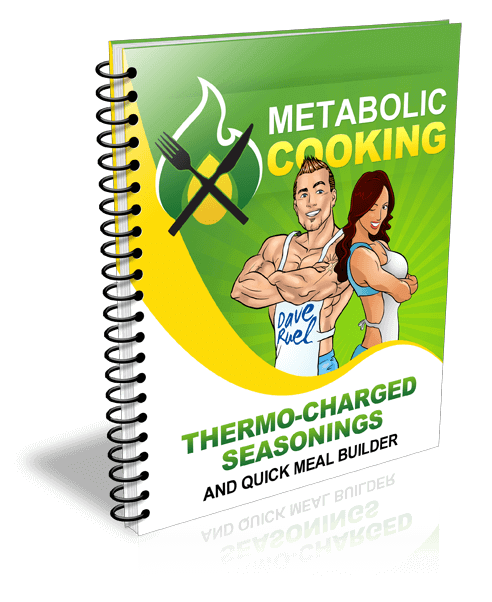 The last of the Free bonus’s, the Metabolic Cooking Quick Sheets were put together to make your life easier. Here is what you get with this bonus! Here Is a short video review of the Metabolic Cooking Cookbook, presented by Karin Losier herself, so a few minutes and check it out! Over all this is a Great product! If you are looking to add Metabolic Cooking into diet your then I highly recommend that you download The Metabolic Cooking Fat Loss Cookbook today! For ten bucks there is no way you could go wrong with this cookbook. The cookbook alone is worth more than that, then throw in the four free bonus’s as well, this is a No Brainier! Even if the Metabolic Cooking Cookbook does not live up to your expectations, or you just do not like the product, is comes with a 60 Day Money Back Guarantee! So the only thing that you stand to lose is a few pounds! Don’t wait though, this low price is a Limited Time Offer and you need to act fast before this incredible deal is gone! If you have any questions or comments, please feel free to leave them below or send me an email and I will get back to you soon as possible. Thank you for taking the time to read my Metabolic Cooking Fat Loss Cookbook Review! It is about time we started leading a more healthier lifestyle, this metabolic cooking cookbook has captured my interest, thanks for introducing me. Eating healthy foods is essential for the performance of our metabolism and aiding weight loss, however just as important is getting plenty of exercise in between meals to help burn off calories. This is a choice weâ€™ve decided to accomplish by going for plenty of long walks nowadays. Having a program like these books offer, using fat burning foods and recipes will spur us on to create a more sustainable lifestyle. We keep slipping back into high calorie meals due to getting stuck on what to cook for the next meal, this cookbook set will help significantly. 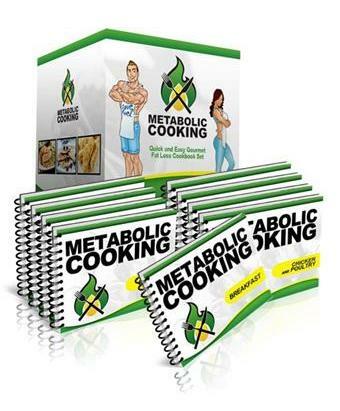 Have you tried this metabolic cooking cookbook Brendon, and how did you get one? Congrats on the decision to change your lifestyle! It is no doubt a tough road but well worth the effort. You mentioned slipping back into old habits, and part of that is because it is familiar and comfortable, and there for, easy to do. Don’t worry just keep working towards your new goal, if you fall make sure you get back up and you will be fine. 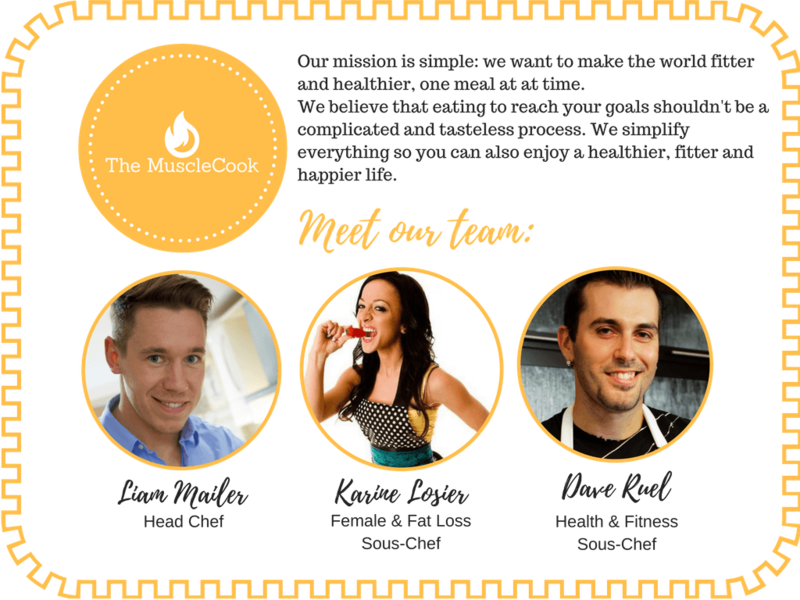 The entire Metabolic Cooking Cookbook was designed to help people achieve their goals and assist in the pursuit of the Life Style change you are looking for. Also you are correct in the idea that physical activity is crucial to weight loss, but keep this in mind. General health and weight loss is 80% diet and 20% exercise! Meaning that you can do all the workouts in the world, but if you do not eat correctly to support those efforts you will not achieve your desired results. Simon I got my copy by just going to, MetabolicCooking.com and you can get your by simply clicking on that link. I wish you the best of luck on your journey, and want to welcome you to drop in on us here at MyBodyMyMInd,net again and see if we have added anything else that may help you along. I would have expected something like this to cost a lot more, $10 is a great price. I’m curious about the meals that this cookbook would have you prepare however, I’m not the best in the kitchen, nor do I like a lot of fancy food. Is it relatively simple to shop for the ingredients called for, and cook the meals from within this cookbook? Yes this is an amazing deal at just $10, there is so much information within it that it was a steal at the original price of $29! 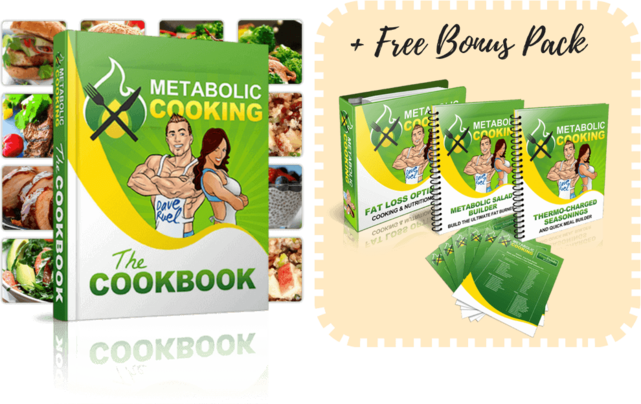 The Metabolic Cooking Cookbook is truly an incredible value, and don’t forget the 4 Free Bonus’s that they are going to include with your purchase! Shirley, as for your concerns about being good in the kitchen, No Worries! Karine and Dave just about take you by the hand, and most of their recipes are quick and easy, to create as well as easy to follow. Within the forth free bonus, the Metabolic Cooking Quick Sheet, they provide you with the Grocery Shopping Masters List. This list shows you exactly what to buy and what not to buy, Dave has even included many great tips to help you save big time at the store and keep your budget as balanced as your eating habits! As for fancy meals, that will all depend on you! Some of the meal plans are fancy,yet still kept simple to prepare, while others are a little more for the everyday or the busy schedule. You will always have the freedom to tweak the recipes as you wish, using the knowledge you gain from the cookbook to create your very own masterpiece! For ten dollars, I do not think you can go wrong with this one Shirley! Please keep in mind that this is a limited time offer and that the vendor may change the price at anytime that they wish to. Hello and thanks for sharing, this is a very interesting book that has so much information, This book is full of great tips, and WOW that is a lot of recipes. I have also just finished writing and article myself on garden recipes. Your post is well detailed and filled with so much good information your readers will love how you break all of this good stuff down and explain it so clearly. Thanks again for sharing this awesome post I am definitely going to break out $10 and get my own copy. Thanks for all of your feedback, and I believe that your are going to love this cookbook! 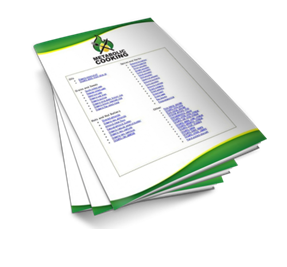 There truly is a wealth of information within its pages. Not only that, but the philosophy that it is not a diet but a life style change will not only help your achieve your goals, but maintain them as well! The Metabolic Cooking Fat Loss Cookbook is jammed packed with quick and simple recipes, and so far all of them that I have tried lack nothing in the taste department! With more than 250 recipes I do not think you will run out of great cooking options any time soon! I hope you enjoy your new cookbook, and remember that there is a 60 Money Back Guarantee just in case it is not for you. I’m not looking to lose weight but I’m all for healthy eating. This looks like a good cookbook. Could you perhaps show a few sample recipes? I love that it has a 60 day money back policy. Always makes me believe its a good product. Thanks for an informative article! The Metabolic Cooking Cookbook is definitely a great product, I have prepared many of the recipes found inside, and I have yet to be dissatisfied. There are a ton of great benefits to eating healthy beyond weight loss, and those include how our bodies use nutrients to aide our organs in the performance they were meant for. The Metabolic Cooking Cookbook was all put together with this in mind, it is a Life Style not a diet. Hollie if you would like to check out some of the recipes that are found in this cookbook, just click on the link below, The staff at Metabolic Cooking have provided 20 recipes that you can get right from their website. I have been struggling with losing a few pounds, it seems that whatever diet i try I end up putting a few more on rather than losing them. This diet interests me, in the thought of being able to eating food that will burn the fat, I had not heard of that approach before. I find it very interesting and will be bookmarking your site. It is definitely possible to lose weight through you diet, after all any fitness and health program is 80% diet and only 20% physical activity. You are not alone when it comes to regaining the weight you have lost on other diets, because most diets just do not work! Most diets focus on cutting this or that out, and we lose weight in the beginning only to put it all back on when we return to a normal diet. That is what makes this different, the Metabolic Cooking Cookbook is designed with the philosophy of lifestyle over diet. In order to achieve true success you must first change your approach! Best of luck in your weight loss pursuit, and I certainly believe that the Metabolic Cooking Cookbook is a tool that will help you along! I’m really just starting to notice the benefits of eating a healthier diet. It’s not just how it’s better for me physically, but also mentally, it’s amazing how much more positive and confident I feel. I still have a long ways to go, and so something like this cookbook would be a really good idea for myself. I like that it tells you which foods you should eat at certain times for optimal gain. That’s really cool! And, it’s only $10, that’s amazing! What a deal, especially when you compare it with so many other weight loss programs (that don’t even always work). I can say from experience, that a change in diet is sometimes the key thing you need for weight loss! Glad to hear that you are beginning to see the over all benefits of a healthy diet, far to often people get lost in the idea of only weight loss. A stable diet platform carries with it many great benefits such as better sleep, better mood, an increased ability to ward off sickness and illness, as well as a more lean and healthy physique. The Metabolic Cooking Cookbook is way more than just some fad diet, the creators have put together an eating plan that will work for a life time. That is truly what you get with the Metabolic Cooking Cookbook, you get a better way to approach your individual eating habits to best suit your own needs. It is more of a life style change than a diet plan, and the benefits can be amazing! Also for that price what do you really have to lose, other than some unwanted body weight! I do not know about you, but I have personally wasted $10 on all sorts of things, and many times, so why not throw down a 10 spot and see if you can change your life for the better! 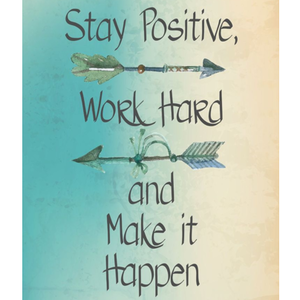 Thank You for taking the time to read our post, and the best of luck to you in achieving your goals! Eating away those extra pounds sounds like a good idea to me. I’ve never really heard of a metabolic cookbook before, but it does make perfect sense. It’s about time something of this nature was on the market. So many diet books are all calorie-based only, instead of teaching people how to prepare and cook food that actually speeds up the body’s metabolism. This book is a great idea. I’ll definitely check it out. Glad we could introduce you to the concept of Metabolic Cooking, and an alternative to the calorie crunch diets that we are all drowning in.. Our food and diet make up 80% of our health and physique, it is far easier to get into, or stay, in shape if we start with the right foods. The Metabolic Fat Loss Cookbook has a ton of incredible recipes that are all designed to help us get the most out of our foods. It is also a road map to a new eating life style, so this is way more than a fad diet, it is a sturdy foundation from which we can grow! Darren, I think these cookbooks will open your eyes to an amazing approach to the preparation of the foods we eat! This is a super deal at $10! Its worth it just to not have to come up with new meals to cook every week. I’m so tired of getting stuck in the routine of cooking the same things over and over again. The health benefits are an added bonus as far as I’m concerned. Also, I’m not sure how they can offer a money back guarantee for a book, but they do! It’s a no brainer! i totally agree that this one is a no brainier! I have my copy, and I love everything I have tried so far, and I have a few more recipes that I an going to cook up this week. The Metabolic Cooking Cookbook has more than 200 recipes so you can go for most of the year and try something new everyday! And the best part is that all of the meals found in this set of cookbooks are healthy, and to this point from mu experience, tasty! Thanks leaving your comment, we love to hear from our visitors! I like this 250 recipes metabolic cooking program. Everyone who wants to lose weight struggles sooner or later. There are all kinds of diet plans out there. But this one is a little different. As I see it after reading this review, dieters concentrate on cooking ‘fat-burning’ recipes. If that works, then it will be great. 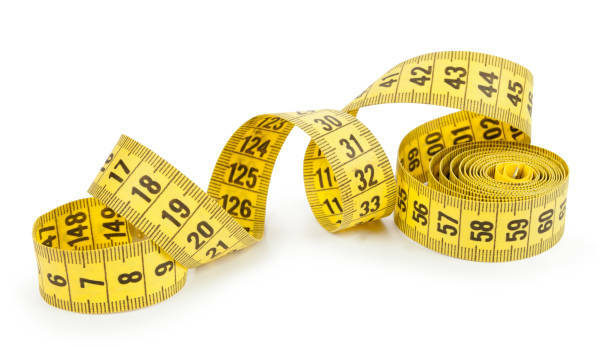 As you say, no one has all the answers to the perfect diet and dieters should be wary. However, what I have found here is something new and interesting. The bonuses look useful, too. And all for a measly $10. I like this. It’s worth buying. I agree that everyone struggles from time to time, i know that i do! What makes this program different is that it is more about a life style change, and less a bout a crash diet. This is way more than just a cookbook, it is a road map to a healthier life. The price of $10 is amazing when you consider all you get! The original cookbook package plus the four free bonuses, how can you go wrong? I have heard it said that weight loss is 80% diet and 20% exercise, so even adding just a little activity to a good diet could have huge impacts on one’s life! Another great thing about the Metabolic Cooking Cookbook is that the recipes taste great, so you don’t even need to have a weight issue to enjoy this cookbook. Also with all of those recipes, it will take some time for this to get old! My husband lost a ton of weight with food combining as you mention in your article. Sixty pounds in three months and has kept it off for twenty five years. Such a powerful tool that I don’t hear as much during what seems to be our carb fearing, keto dieting time in history. Thanks for bringing back an oldie but a goodie. We can’t forget about these methods! I am sure his efforts brought on an entirely new life style when he started out and I think that is what most people miss. If you want true and lasting results you must change your way of doing things and living! There is no other way around it. We live in such a rapidly changing world these days people seem to just jump on board with any new fad that is going around, and forget about the time tested methods of a healthy living. Add to that the great recipes that the Metabolic Cookbook contains, this is a great one to have on hand anyway! This is something I am definitely going to try, you have done a great job explaining this product in such depth. I know what you mean about weight fluctuating, I have had the same problem. It can be hard to eat healthy sometimes because it can become so boring! That is one of my favorite principles of this cookbook. The Metabolic Fat Loss Cookbook has a ton of great tasting recipes all designed to help keep our furnace fired up. There are enough recipes and recipe combinations found in this cookbook that you can literally go a year or more and not have the same meal twice! Also, since this is a digital product it is quite inexpensive, costing only $10. You just can;t beat that! Jamie I know you are going to enjoy the recipes found inside the Metabolic Cooking Cookbook. In addition to that it will show you what pairs together to give you the best boost for your metabolism and overall well being. I am so happy that you enjoyed the review,. please let me know your thoughts as you get going with it! I am always looking for new ways to improve my diet without the constant deprivation of crash diets. I’m glad that this is not one of them. I am a vegetarian (I eat dairy and eggs but no meat). Do you know if this book contains many vegetarian recipes or is it mostly cooking with meat? One of the things I hear the most about healthy eating is lack of flavor, and deprivation. The truth is that neither has to be the case! Amy this cookbook contains dozen of recipes specifically for vegetarians. It would be a great addition to any kitchen! Also you could even enjoy some of the other recipes if you are creative. You could substitute egg plant for the meat choice, or any of your favorite vegetarian substitutes, so you get even more options as to what you can get out of the Metabolic Cooking Cookbook! For only $9 I think you will find this cookbook right up your alley! The health industry has transformed into a new dimension and now it’s probably one of the most exciting times to live in. And it keeps only getting better. A few months ago I realized that I needed to lose some weight and get back into shape. For the price I figured I would give the Metabolic cookbook a try. I have transformed my eating habits and have really seen some great benefits from it. I definitely recommend everyone try the Metabolic Cooking Fat Loss Cookbook to transform their lifestyle because nothing’s more important than your health! You are correct, it is a great time to be alive! The health industry has come a long way, and we now know so much more about nutrients and how they effect us. Tyler I know that you are aware of how boring it can be to eat healthy. that is what makes the Metabolic Cooking Fat Loss Cookbook so great! It is packed full of great recipes that are not only packed with flavor, but great for our over all health and weight control! Tyler I am glad you have felt the results of changing your diet habits, and equally glad that the Metabolic Cooking Fat Loss Cookbook was able to help! Keep up the great work and let me know of your progress! The metabolism is something that has always confused me. Some of my friends seemed to eat whatever they wanted in whatever portion without much ill effect. While I have always struggled with gaining weight eating the same things. I really liked your review and agree that by adjusting the seasonings can make boring plain dishes taste brand new. I have found it best if I try and eat what feels best independent of what scientific research shows. Right now I am following the Paleo Diet and feel great. The Paleo diet is a great choice! 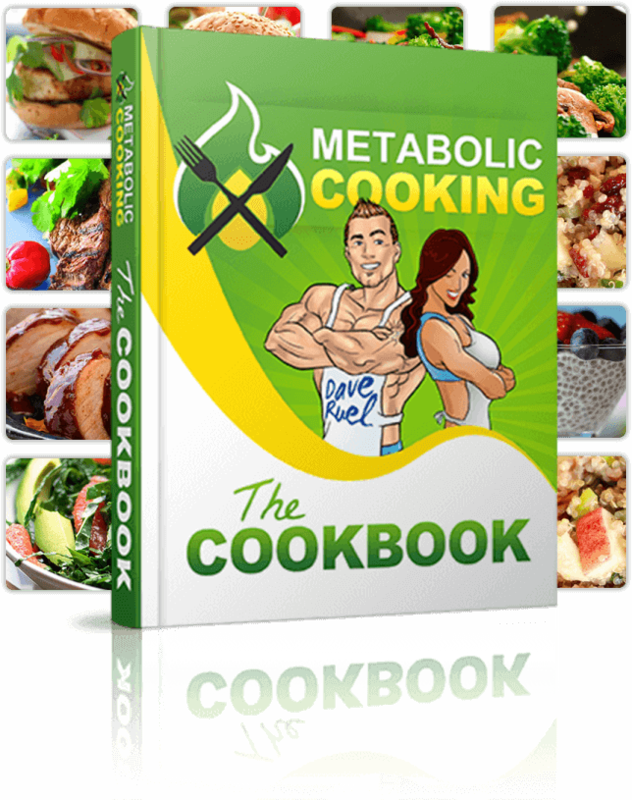 The Metabolic Cookbook is just another great option for those looking to boost their metabolism and not lose the flavor. You can even use these recipes to aid in the Paleo diet. Any diet out there can incorporate the cooking tips and recipes found inside of the Metabolic Cooking Fat Loss Cookbook!